Cardigans are the rare combination of being both comfortable and stylish. They’re perfect for layering and can be shrugged on and off without fear of ever-changing temperatures, whether at work, play or home. 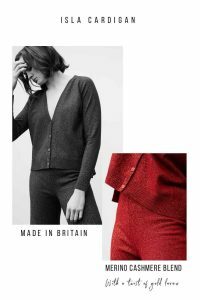 The easiest knitwear piece to wear styled over a Tshirt and jeans or tucked into tailored trousers or a high waist skirt for a slimmer silhouette. 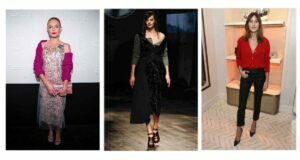 Not forgetting the cardigan the perfect way to add an insouciant edge to any evening look or wedding guest outfit. I love a little Prada inspiration, by layering a cardigan underneath a sleeveless dress or dungarees. such as The Cerys Hand Intarsia. 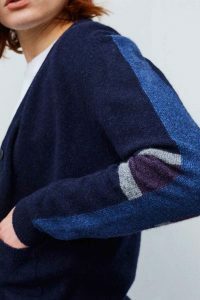 It took me a couple of years to design the GS cardigan, I wanted to create a style that was seasonless and could endlessly work with your wardrobe. I am very excited to share with you the GS cardigans with effortless style with a modern twist, I honestly can’t stop wearing them.